Corsair has updated its venerable VOID series of headsets with the VOID PRO. At face value, they appear the same, even down to the specifications. Underneath all that, though, is a ton of small improvements. We take the VOID PRO Wireless for a spin and hear how it performs. 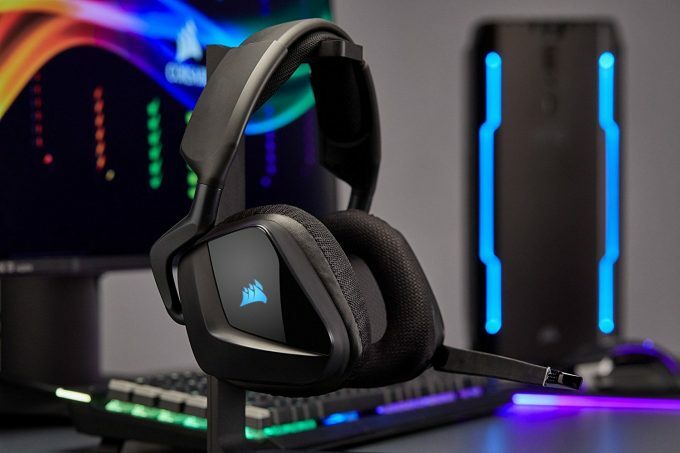 Corsair made a splash in the PC audio market many years ago, and it continues to create better iterations of its headsets each time. Today marks the launch of what can be best described as a refresh of its last generation VOID headsets. Lots of small changes and tweaks that help create the VOID PRO line-up. There are four headsets in the VOID PRO launch, an analog headset, USB RGB headset, and two wireless headsets, one of which, the VOID PRO RGB Wireless, is under review today. Corsair’s briefing on this was basically summarized, in an excited tone, that pretty much everything about the original VOID was updated. The sound quality, the build, performance, and there was particular emphasis on the microphone. Looking at the specs between the old and the new units though, there is nothing that really sticks out, except for a slightly more sensitive microphone at a lower impedance, but otherwise everything is the same. A lot of the changes are to do with tuning, materials, acoustics, and general quality of life type changes that don’t show up in the spec sheet. The first thing that Corsair emphasizes is the comfort aspect with an all new memory foam and padding material. This stuff is soft… I mean, really soft. The headset doesn’t weigh a whole lot, but picking up the headband with one finger, the foam pad fully depresses. The ear cups are made from the same material as well, and both are covered with this mesh-like material to help the foam breath. After wearing this VOID PRO Wireless headset for 6 hours straight, and there was absolutely no sweat, itching, or general discomfort. There is one small issue, at least for me, and it’s that Corsair seem to have played it safe when it comes to the clamping pressure around the head. Because the pads are so soft, it’s likely they backed off on the pressure, but to me, it almost feels loose. There is still reasonable isolation, but it doesn’t feel like a closed-back design. I can still hear myself tapping away on the keyboard, and the gentle hum of a desk fan, but everything is still somewhat muted. This semi-open feel does mean that audio is a little more open, too; not that harsh, claustrophobic sound you can get with fully isolating ear pads. 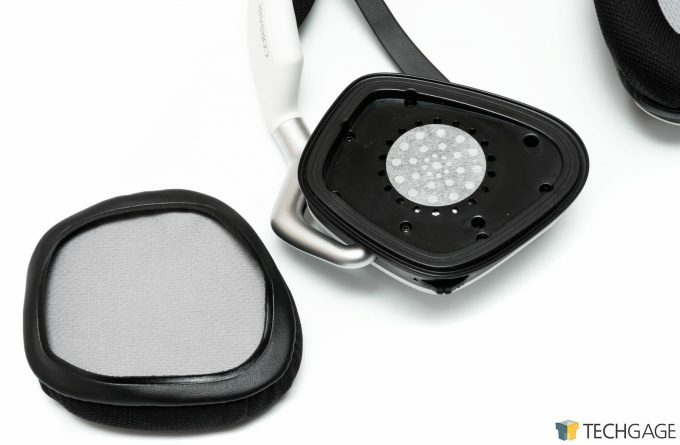 The physical construction of the VOID PRO uses many of the same elements as the other VOID headsets. The yokes that connect to the ear-pads are aluminum, the headband is a PA6 glass fiber reinforced plastic with a spring-steel insert. They have a lot of flex and should be able to take a bounce off the floor or two without breaking. Despite the flex, you still can’t really push them in tighter for a stronger clamp around the head, but there is a generous amount of extension in the headband for those with larger noggins. Corsair said that it overhauled the 50mm drivers with extra padding and supporting cavities to change the profile of the sound. That was one thing that didn’t really impress me with the old VOID headset, it was super bass heavy with pretty much no regard for anything else. As a result, it was left muddy sounding, no clarity to speak of. This time around, the VOID PRO backed off on the bass with more emphasis on the mid-range. There is still bass, it didn’t all disappear, but the extra clarity from the mids means that all those audio cues and dialog are a lot easier to make out. It also means the VOID PRO can actually play music faithfully without all that bass boom from the original. The available EQ options means that you can tune the headset if you wish to bring back that big-bass. It’s kind of silly to bring this up, but if there was one fatal flaw with the original VOID series, it would have to be the horrendous microphone that was bolted on. I was critical of it in an old review where I called it ‘less than ideal’ due to its inflexibility, lack of noise canceling, picks up breathing, and in general was just plain poor. The new mic in the VOID PRO is better, but not overwhelming. It still has that classic live-chat ring to it, but is adequate. The noise canceling is much improved, keyboard noise will still get through, along with background fans and such, but the extra flexibility means that you can position the mic better. It’s not the most sensitive mic going, so teammates will likely need to bump you up in chat. The one feature I do like about the mic is the ability to just flick it up out the way and it auto-mutes – I believe this is limited to the wireless headset only. 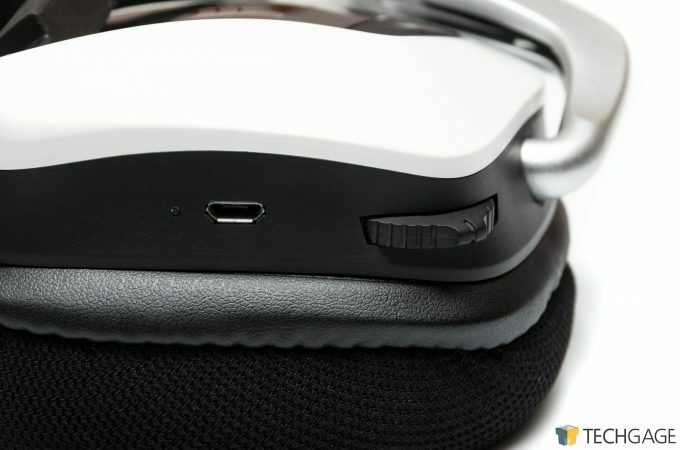 Speaking of wireless, the VOID PRO Wireless is… wireless! The usual USB stick that works over the 2.4GHz band is included and already paired, so it really is a case of plug and play. Audio quality over wireless is actually not bad, and the range is acceptable, but don’t expect it to stream from one end of your home to the other. This is a very small tell-tale background his from the integrated amp/DAC, but this is a lot quieter than previous models. You would need to be in a very quiet room to even notice, and it’s in no way distracting. Battery life is very typical, but heavily dependent on various factors. The 16 hours quoted is optimistic to be fair, but again, it will depend on volume and whether you are streaming music/audio constantly. It’ll definitely last a full gaming session, or a couple of days of casual use. If you decide to enable the various RGB modes (which you can’t even see when wearing the headset), then battery life is significantly diminished. The good news though is that you can charge the VOID PRO Wireless and use it at the same time, with no ill effect such as buzzing, distortion or background noise – bizarrely a rarity these days. Judging when to charge though, is tricky. At this time, us early reviewers have used beta versions of the CUE software (2.16.87 at publish), and its battery level indicator is wildly inaccurate. For one, this headset seems to never go above 85% charge. When in use, it’ll drop to 80% rapidly, then hold there for up to an hour, then start dropping again. When it gets down to the 50% mark, the charge level is more accurate, and it’ll alert you when it gets down to 15%. On the software side of things, there isn’t a huge amount to go over. It uses the same CUE suite that Corsair has built over the years, complete with full integration with other Corsair peripherals, such as synchronized lighting. 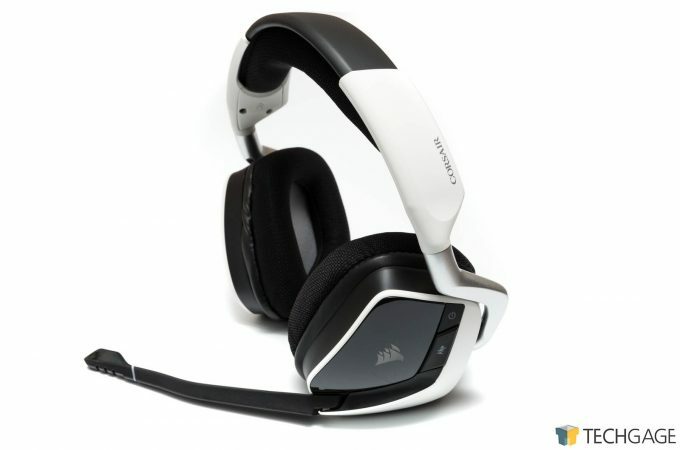 The two ear-cups can be set to static colors, blinking fading, breathing, rainbow fades, and linked to other peripherals. The EQ presets lets you flick between 5 different profiles, or create your own. You can only have 5 active at a time, so if you wish to create a new one, you will have to disable one of them. The EQ adjust responds best when using small changes, as pushing sliders to the extreme doesn’t enhance, but instead lowers the other frequencies. These presets can be switched without the software by pushing in the dial control on the headset. A long press on the dial, enables and disables the Dolby Headphone 7.1 mode. This isn’t something that I could really get to grips with, as I personally didn’t find the mode particularly useful. This is something that’s very hit or miss with a lot of people, as the same effect on different headsets can either work or not. The game engine will play a large part as well. The VOID PRO will appear as an 8-channel device and do the usual HRTF to simulate surround sound, the rest is up to the game. Otherwise you can just turn it off, leave it in stereo and just enjoy things that way. The toggle switch for this is useful. There are other convenience features as well, such as holding the mute button to enable and disable the sidetone feature, more commonly referred to as mic monitoring. This lets you hear yourself through the mic, giving you feedback as to how loud you are (useful when dealing with closed-back headsets). 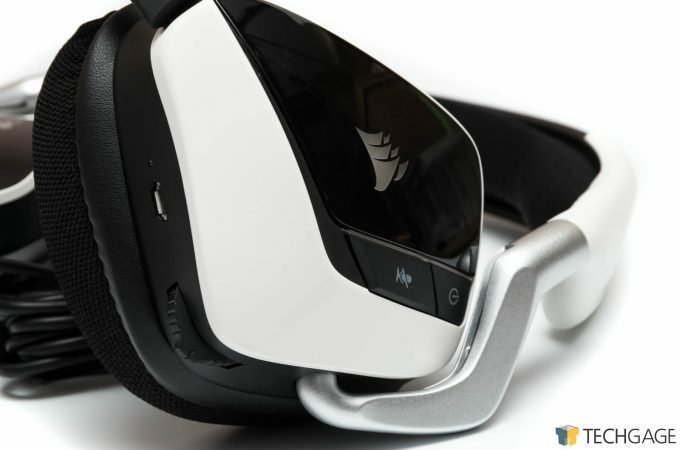 Corsair’s VOID PRO series of headsets are a justifiable update to the VOID series. It’s the little things that ultimately make it better; all the attention to detail. 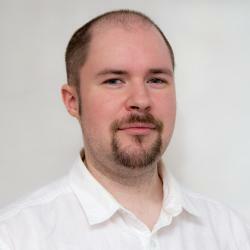 The Wireless headset is actually well made and sounds reasonable. A real pair of headphones will sound better, but will likely tether you to a cord. Battery life is also good enough for a couple of days of gaming, or a long night of Netflix and chill. If you are in the market for a headset and have been eyeing up a VOID headset, we would recommend you go with the VOID PRO instead, as it inherits all the winning features, while also providing a better all-around experience. Also, did I mention how soft the pads are? They’re like clouds… worthy of our Editor’s Choice. 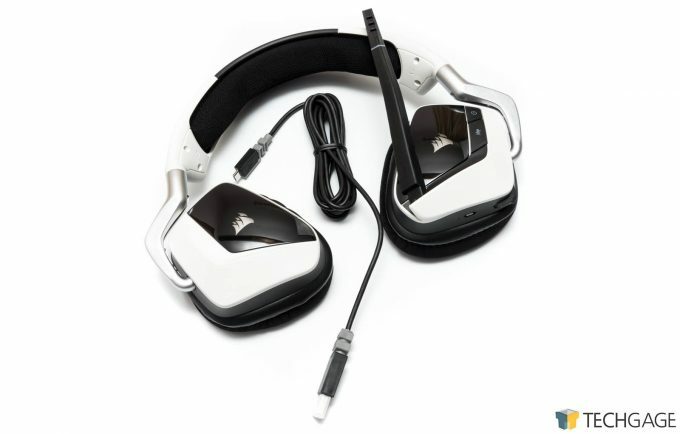 VOID PRO headsets range in price from $80 for the two non-wireless versions, $100 for the Wireless version reviewed, and $130 for a special edition version of the wireless.